The field of materials science has become abuzz with “metal-organic frameworks” (MOFs), versatile compounds made up of metal ions connected to organic ligands, thus forming one-, two-, or three-dimensional structures. There is now an ever-growing list of applications for MOF, including separating petrochemicals, detoxing water from heavy metals and fluoride anions, and getting hydrogen or even gold out of it. Now, a team of chemical engineers at EPFL Valais Wallis have synthesized a new biologically-derived MOF that can be used as a “nanoreactor” – a place where tiny, otherwise-inaccessible reactions can take place. Led by Kyriakos Stylianou, scientists from the labs of Berend Smit and Lyndon Emsley constructed and analyzed the new MOF with adenine molecules – one of the four nucleobases that make up DNA and RNA. “The adenine molecules act as structure-directing agents and ‘lock’ thymine molecules in specific positions within the cavities of our MOF,” says Kyriakos Stylianou. 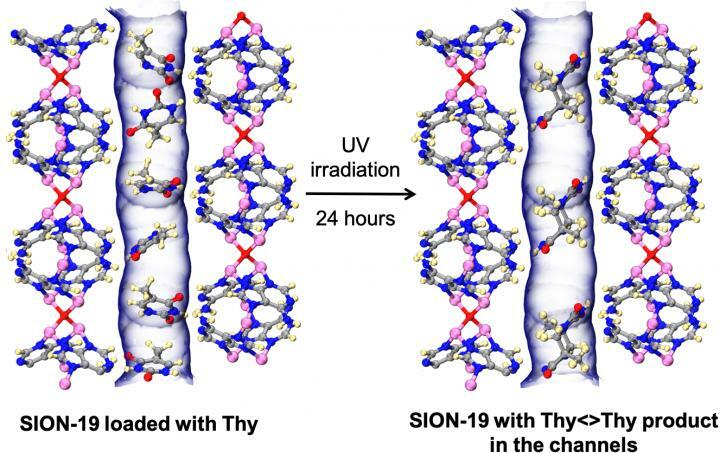 So the researchers took advantage of this locking and illuminated the thymine-loaded MOF – a way to catalyze a chemical reaction. “Overall, our study highlights the utility of biologically derived MOFs as nanoreactors for capturing biological molecules through specific interactions, and for transforming them into other molecules,” says Stylianou.